Miss Singh: NEW JEWELRY PIECES! If you know me, you know I love jewelry. Recently, I have added some gorgeous pieces to my jewelry collection that I am obsessed with and wanted to share with you all. Now a lot of my jewelry has been black, gold and silver because I have just found them to work best with what I have been wearing lately. These pieces were found in many different places and I love them so much! My newest additions are these bracelets from Joseph Nogucci. They were kind enough to send me these gorgeous bracelets that just go perfect with any outfit. I love pairing these together or individually and they look adorable! Now I have to say when I first saw them online I thought they were just beads, but they are great quality and are different unique stones paired with stainless steel and gold finished beads. They have a huge variety of designs, colors and stones and I just can't stop stacking these together. They have some awesome deals on their website right now so go check them out! Another piece I have been obsessed with is this silver choker. I have been obsessed with chokers lately. I just think they are so simple, but add a little sexiness to any outfit. I pair them with long chains or with another chocker. This silver one was bought in India at a jewelry exhibition, but I'm sure you can find similar pieces online. I love the rusty silver look to it that I can wear when I am out at a party or just getting some lunch with friends. I am truly obsessed! I wanted a thiner chain choker to pair with this thicker one which is when I found this dainty yet so beautiful chain. It's from my mom's collection and is a gold chain that I got cut to make it a tighter choker. Another choker I bought with the silver one is this gold piece. Also from India, it is thicker and has way more detail than the other ones, but I love pairing this with a simple black top because it makes the outfit way more effortless, stylish and over all makes it pop! I also love this Chanel like necklace. It is long and and super sleek. It has that classy but edgy look to it that I love and is another one that goes well with a lot of the stuff I wear. This gold chained necklace that goes with everything is awesome. 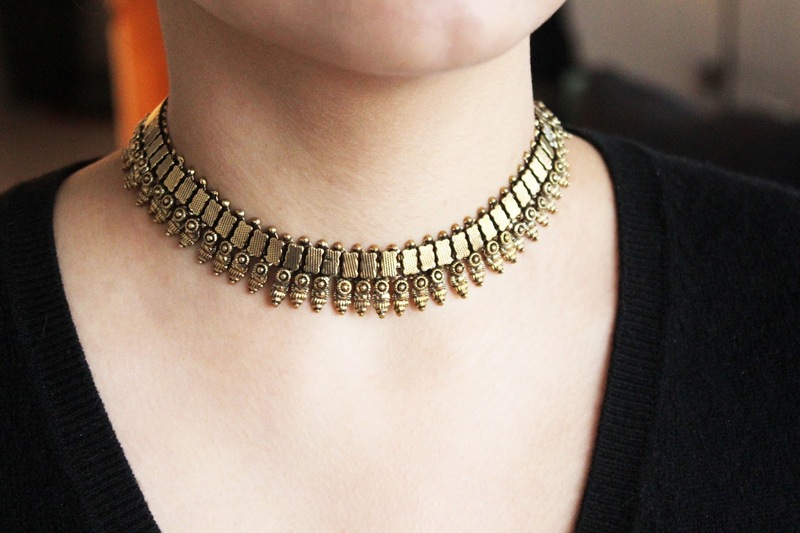 It has three different types of chain designs which makes it more unique than a typical gold chain. It is easy to just throw on when I don't know what to wear. These two bracelets have been my favorites for everyday when I am going for a comfortable but chic look. I love evil eyes and always gravitate towards them. The blue evil eye bracelet was a gift. It's such a pretty aqua color. The gold evil eye bracelet is super dainty and is another new addition that I cannot stop wearing. I linked whatever I could find above, but many stores/online retailers make similar pieces. I love how just some of these pieces can change your whole look and outfit. Accessories are such key items for me and I love them! Disclaimer: Joseph Nogucci kindly sent me three bracelets(the first picture). All my opinions are my own and 100% true! All the other jewelry was purchased by me.